One of the best things about the holiday season is families gathering together — for me, anyway! I love all my various families that graciously have allowed me to be a member but of course the one closest to my heart is my original family: the Wood clan. 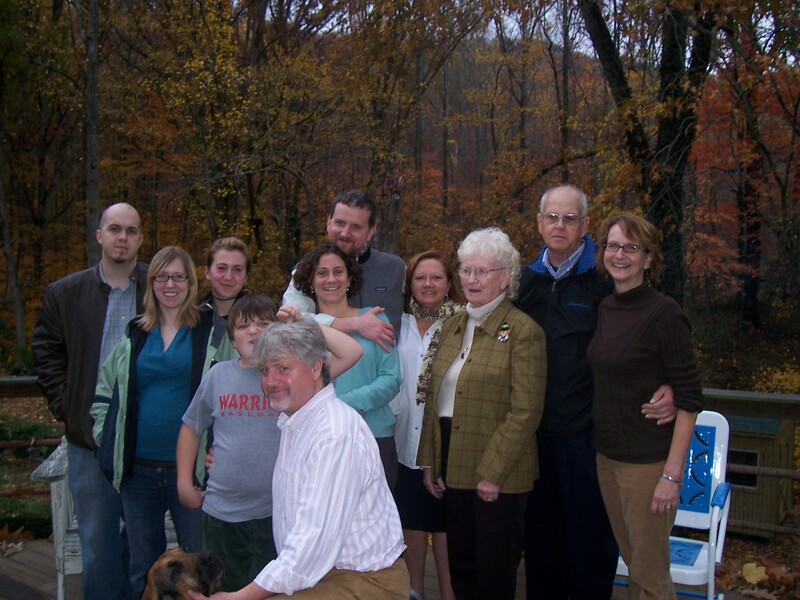 With everybody scattered — me and my family in Alabama/Mississippi; middle brother and family in Chattanooga, Tennessee; younger brother and family in Portland, Maine; and our parents still in Wood Family Headquarters in middle Tennessee — we only can manage a full get-together every year or so. The most recent was this past Thanksgiving, and even then my newspaper-sports-editor husband was missing since Thanksgiving is a big day in his line of work. So we’re trying again today and it looks as if everybody will be there — even almost-eight-months-old Nolan, who hadn’t quite made his appearance in the 2007 photo. Dinner tonight kicks off an anticipated week of friends, family, food, feasts and fun. Can’t wait! This entry was posted in family, food and tagged family, food, friends, holidays, Thanksgiving by Coffee with Cathy. Bookmark the permalink. I guess it’s left to me – not pictured – to give the first report on Sunday’s gathering. It was nice to see my wife’s whole family gathered in one place. She and her younger brother, Michael, are always a stitch to be around. He can really get her going. As always, grandbaby Nolan was the star of the show, even if he had to be hustled off stage left before the entrees came so he could stay on his nap schedule. I was thinking how fortunate he was to come into the world with a great-grandfather and great-grandmother still living. He will have fine memories of them. It’s one of the ways the world is changing … my maternal grandmother was dead, after several years of ill health, by the time I showed up in 1957. My great-grandparents were long,long gone. In another 50 years, no one may think twice about the great-grands being around. You are so right, sweetie. Well said. But did you not notice that this photo was taken on Mark’s deck in Chattanooga,Tennessee, which is not where we were this past Sunday??? ?